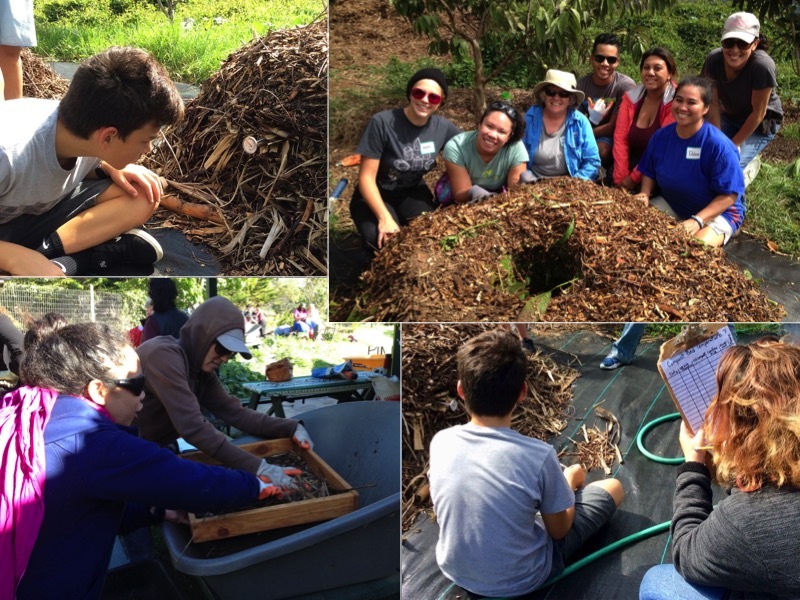 What do composting and soil fertility have to do with science and engineering practices, cross-cutting concepts, and disciplinary core ideas—the three dimensions of the NGSS? Dr. Art Sussman (“Dr. Art”), PCEP Co-PI, along with partners from The Kohala Center and Mala‘ai Culinary Garden, co-facilitated an exploration of the NGSS through gardening skills and content for 2 days in November 2016 at the Mala‘ai Culinary Garden, Waimea, Hawai‘i Island. The participants—consisting of both classroom and garden educators—practiced engineering design skills, including understanding criteria and constraints to create compost piles, which will ultimately increase soil fertility—an important way of adapting to climate change impacts. The participants built three compost piles using a variety of plant materials, and arranging the piles in different shapes and sizes. Dr. Art guided the participants’ observation of energy flow and the cycling of matter in the compost piles and the garden. The participants traced the energy stored in food grown in the garden back to the source, the Sun, noting the transformation of energy as it flowed through different materials. The participants also noted how matter cycled and changed from the layers of leaves, sticks, and twigs in the compost pile to rich, dark humus full of microorganisms and nutrients. Then, through a one-act science play about Earth’s systems, Dr. Art guided the participants to connect their observations of energy flow and cycling of matter to climate science. They understood that an imbalance in the materials system, such as excess carbon dioxide, affects the rate of energy transformation, which then changes weather patterns. PCEP would like to thank Dr. Art Sussman and the partners—The Kohala Center and Mala‘ai Culinary Garden—for the opportunity to collaborate on climate change education through the lens of the NGSS three dimensions in learning gardens.